Born in Philadelphia, Joshua’s career began in his late teens as co-founder and owner of one of the city’s fastest growing travel agencies in the late ‘70’s. Schwartz quickly became a leading agent for Holland America Line driven by his passion of ships and the industry. He left the company in the ‘80’s moving to California where he launched and grew a strategic marketing and design firm. A cruise related project brought him to Miami in 2000 with a renewed desire to work with travel enterprises marketing their products and services - Joshua’s forte is branding, corporate ID and image enhancement. Soon after his move to Miami, he began a serious cruising campaign satisfying his love for the ocean and ships - some would call him ship - struck. Joshua does not profess to be a professional photographer or writer (however, as demonstrated, the imagery is striking) - just an honest communicator and friend. He currently has a lifetime of cruises planned and lives with his cat, very well cared for by his loving neighbours when he travels, which is more often than not. Top bucket list item : a world cruise of course. Sailing on over 140 cruises plus three crossings on the QM2, Joshua’s first cruise was in 1965 on Holland America’s SS Rotterdam V - the Grande Dame. His love for the oceans and ships is what drives him - sharing these experiences through pictures and sentiments is his passion and he expects to continue this journey through a series of future books, the sale of ready-to-hang prints and the proposed opening of galleries in the UK and USA. For Joshua, life is a journey and he is living his dream. 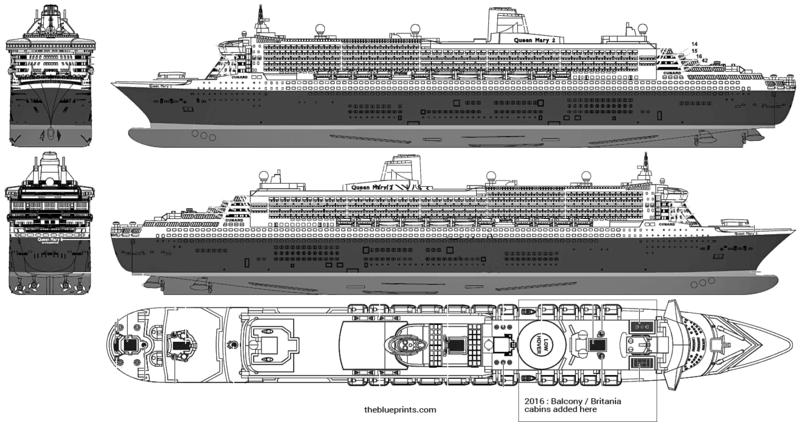 There are four guest stair towers arranged along the length of the ship. 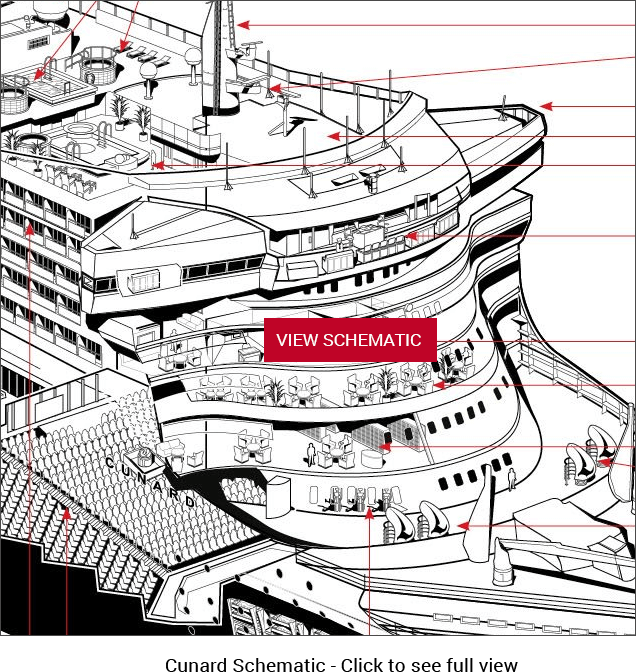 The forward and aft stairs have three lifts arranged across the beam of the ship within the stair tower. These lifts are sized for 21 persons and are grouped for triplex operation. The two remaining stair towers each have six 12 person lifts arranged in triples. Four panoramic lifts are arranged on board, two within the Grand Lobby (capacity of 11 persons) and two (capacity of 16 persons) running up the outside of the forward superstructure. * PRE- Remastering, the Grand Atrium lifts were removed in 2017. 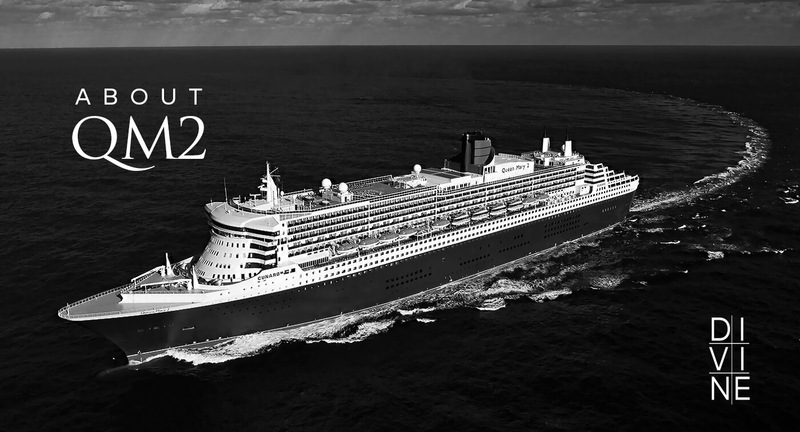 Queen Mary 2 offers regularly scheduled transatlantic crossings between Southampton and New York, in addition to voyages to the Mediterranean, Northern Europe, the Caribbean and Canada. 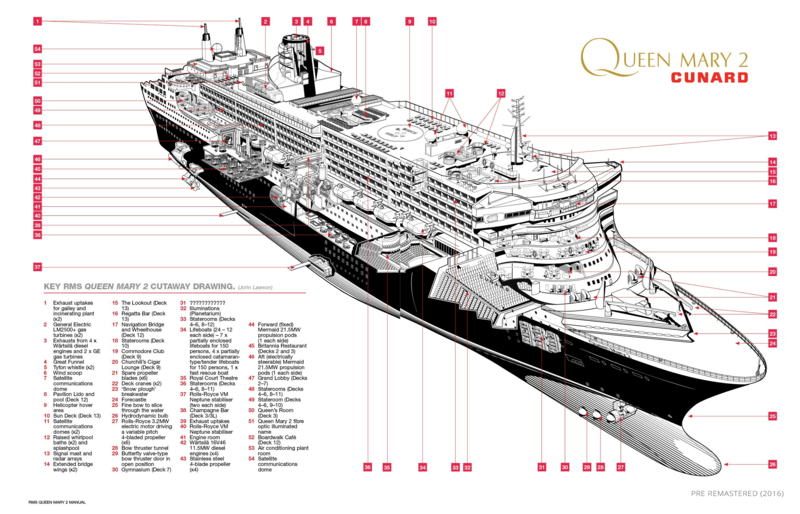 QM2 also operates a yearly around the world cruise. The wine list consists of 343 different labels of wine. Annual wine sales will be 230,000 bottles. Over 7,000 bottles of champagne were consumed during the QM2’s inaugural events period. The annual sugar consumption would make eight million scones. Enough toilet tissue will be used to wrap the earth almost five times. The QM2 will use almost 7,000 boxes of strawberries each year. The annual tea consumption would fill an Olympic size swimming pool. The QM2 will serve 1.5 million drinks per year, not including wine sales. The annual beef consumption would supply a city the size of Southampton each year. The on board baking requires the use of nearly 8,000 industrial sizeflour bags. Stacking them would make a pile five times higher than the Eiffel Tower. The weight of pineapples used per year match the weight of 50 SUVs, almost 90 metric tons.